Professing his innocence and blaming a vast government conspiracy, self-described “attorney for the damned” Edgar Steele was sentenced Wednesday to 50 years in federal prison for a foiled murder-for-hire plot that targeted his wife and mother-in-law with a car bomb. In an hour-and-a-half rant before U.S. District Judge B. Lynn Winmill in Coeur d’Alene, Steele called the case a conspiracy by the federal government, anti-hate groups and the Russian mafia to silence him for his political views and legal work. “I, too, am a victim. My entire family is a victim. 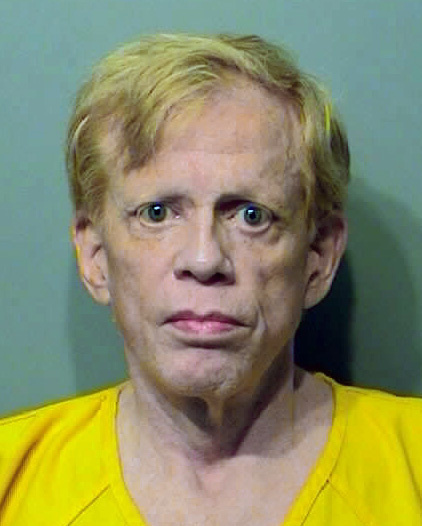 In fact, all of American society is a victim in this case,” said Steele, 66, who defended Aryan Nations founder Richard Butler in the 2000 landmark civil case that bankrupted the racist group. He also authored a book, “Defensive Racism,” and wrote essays on a website, ConspiracyPenPal.com, from his home near Shepherd Lake, southeast of Sandpoint. “I am not delusional. I am a well-educated professional with a long track record of honesty,” Steele said, wearing a gray sweatshirt and orange jail pants. He vowed to continue fighting to prove his innocence. “If I finally have to fire every lawyer in the country and hire myself, I’ll do it,” Steele said. In Steele’s case, “a conspiracy can only be found if you ignore the facts and your worldview dictates that there’s a conspiracy everywhere,” Winmill said. Steele’s wife, Cyndi Steele, stood up when Winmill asked her husband to stand while he was sentenced. Cyndi Steele left the courtroom sobbing after her husband’s sentencing and repeatedly yelled “You’re all wrong!” at media and law enforcement in the courthouse hallway. The Steeles have three children, who were not in court Wednesday. A jury in Boise convicted Steele of four felonies May 5 for paying his handyman, Larry Fairfax, in silver to kill Steele’s wife and mother-in-law with a car bomb. Prosecutors said his aim was to spend time with a young Ukrainian woman he met online. Steele called his wife after his arrest and told her to say the voice on the FBI recordings was not his, which led to a conviction for victim tampering. Steele’s been in jail since his arrest in June 2010. Fairfax is serving 27 months for placing a pipe bomb under Cyndi Steele’s car and not telling authorities. Steele’s law license has been suspended in Washington; he relinquished his license in Idaho to avoid disciplinary proceedings. Her statement was cut short because she repeatedly told Winmill she wasn’t a victim of her husband, and Winmill said the speaking time was reserved for victims. Assistant U.S. Attorney Traci Whelan cited Edgar Steele’s “long, long pattern of manipulative behavior” when recommending the 600-month sentence, which Winmill said is the longest he’s seen as a federal judge. Steele’s lawyer, Wesley Hoyt, asked for him to be sentenced to time served. Steele reiterated that request. He described errors at trial by his lawyer, Robert McAllister, of Colorado, who has since been disbarred for stealing money in a case unrelated to Steele’s. He blamed law enforcement for taking the word of Fairfax, whom he described as “oafish” and a “self-admitted pipe bomber,” over his own. He also asked Winmill to sentence him to a thousand years in prison, saying any sentence was a life sentence at his age. “Put me in the Guinness Book of World Records,” Steele said.